Jennifer Chu | MIT News Mar 19, 2018. 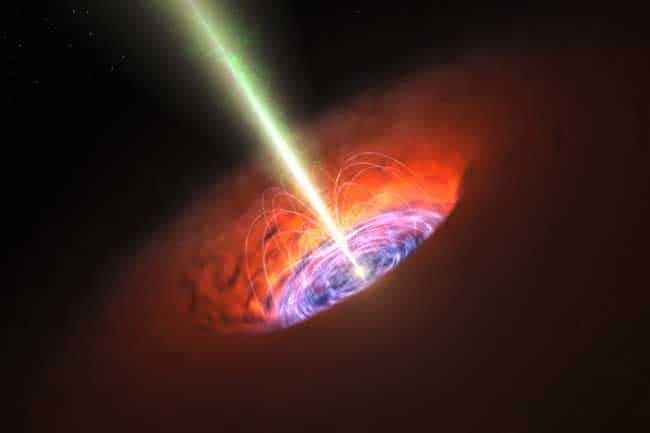 On Nov. 11, 2014, a global network of telescopes picked up signals from 300 million light years away that were created by a tidal disruption flare — an explosion of electromagnetic energy that occurs when a black hole rips apart a passing star. Since this discovery, astronomers have trained other telescopes on this very rare event to learn more about how black holes devour matter and regulate the growth of galaxies. Pasham and van Velzen looked through data recorded from a tidal disruption flare discovered in 2014 by the global telescope network ASASSN (All-sky Automated Survey for Supernovae). Soon after the initial discovery, multiple electromagnetic telescopes focused on the event, which astronomers coined ASASSN-14li. Pasham and van Velzen perused radio data from three telescopes of the event over 180 days.The researchers looked through the compiled radio data and discovered a clear resemblance to patterns they had previously observed in X-ray data from the same event. When they fit the radio data over the X-ray data, and shifted the two around to compare their similarities, they found the datasets were most similar, with a 90 percent resemblance, when shifted by 13 days. That is, the same fluctuations in the X-ray spectrum appeared 13 days later in the radio band.